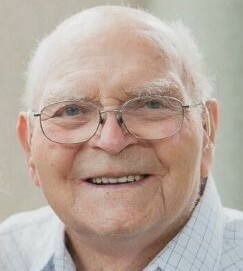 Wolfgang Arndt (Manne) Salle of Kamloops, BC (formally of Barriere, BC) passed away peacefully at Marjorie Willoughby Snowden Memorial Hospice early Dec 23rd , three days short of his 103rd birthday surrounded by wife Georgina (Geordie) and family. Born on the family homestead at Boulder Mountain in Chinook Cove, BC on the 26th Dec, 1913 to Ernst and Emma Salle, who were new immigrants from Germany. The family was booked to come across the ocean on the SS Titanic in 1912. Fortunately, their luggage was late arriving so they changed their departure to the next ship called the Corsica. Manne leaves behind his loving wife Georgina (Geordie) of 44 year of marriage, step daughters Diane (Gary) Bloomfield, Dodie (John) Lysak, Leslie (Jody) Kennedy, 6 Grandchildren and 9 Great Grandchildren. He was predeceased by his parents and siblings; Volkmar, Uli, Bruno, Herta and Inge as well as his step daughter Pat (Len) Jenkins. Manne is survived by many relatives as well as a close nephew Karl (Debbie) Rainer and family in Darfield. Manne acquired a variety of jobs throughout his life. Starting with farming the family farmlands, moving on to hewing and skidding trees, repairing farm equipment, filing saws and working in sawmills, running a trucking business, building Cahilty School and adding on the 4th classroom to Barriere High School. His main profession was an electrician. He wired many homes when electricity came to Barriere and the North Thompson Valley as well as installing electrical water pumps and irrigation. Over his lifetime Manne was involved in a medley of organizations; Barriere United Church, Yellowhead Pioneer Residence, North Thompson Fall Fair, Darfield Community Hall, Barriere Curling Club and many more. He was a tremendous example of what a kind heart and willing hands can accomplish. After spending the majority of his life in Barriere and summers at East Barriere Lake, Manne and Geordie moved to Kamloops to live at the Chartwell Ridgepointe Residence. Manne celebrated his 100th Birthday with many family and friends joining him at the Barriere Fall Fair Hall in 2013. Memorial Contributions can be made to Barriere North Thompson Fall Fair, Barriere Curling Club or Kamloops Hospice. Thinking of you and remembering Manne fondly. He was a great friend of my parents. Mom will be sad he has gone, but Dad will be happy to see him arrive. I so enjoyed his ready smile and sharp wit. Deepest condolences to Geordie and family. Barriere. I will never forget Manne’s kind heart, big smile and kind words.